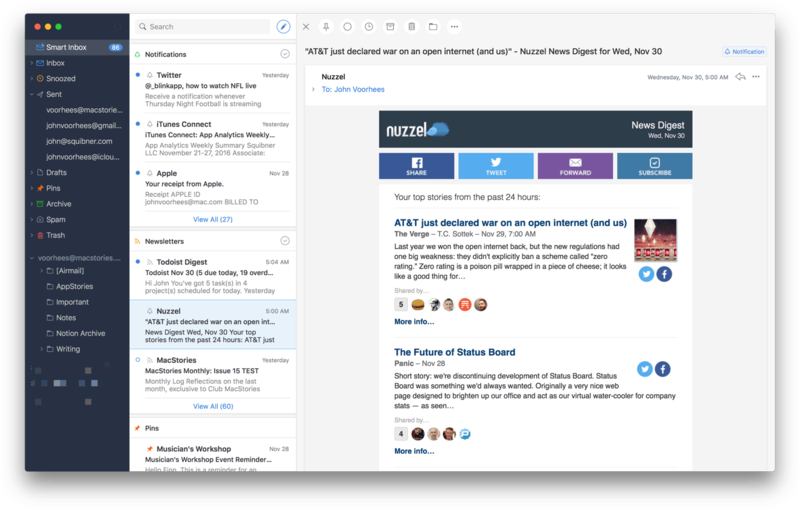 Competition among email clients on the Mac and iOS has heated up over the past couple of years. With that comes innovation, making email clients one of the most interesting app categories. 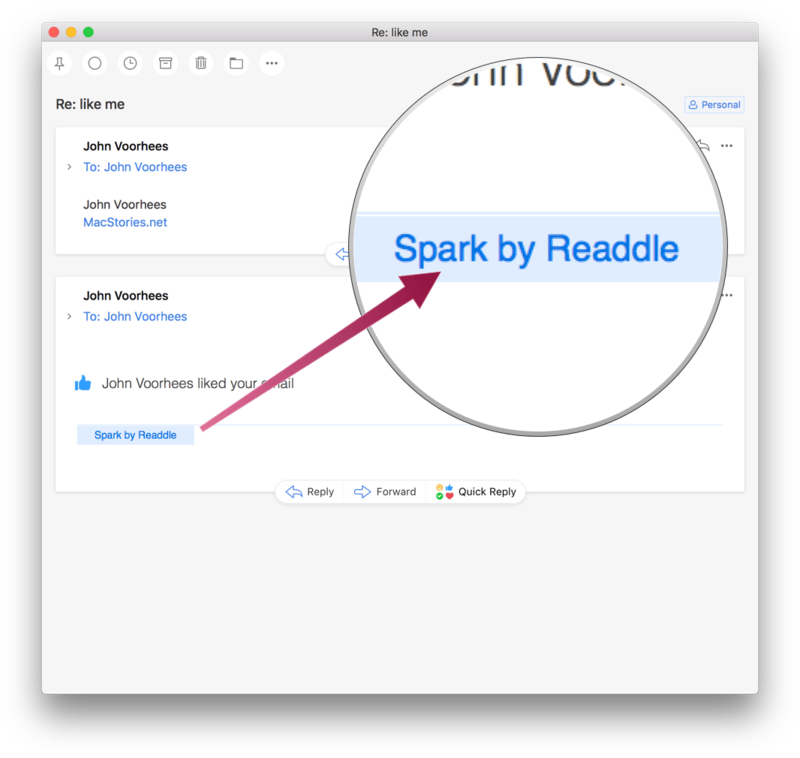 Today, Readdle released Spark for Mac, bringing its popular iOS email client to the Mac for the first time. Spark excels at bringing order to the chaos of your inbox and providing tools to help you quickly triage common types of email individually, or in bulk. But perhaps the greatest benefit of Spark for Mac is that it’s a solid free solution for fans of the iOS version of the app who felt constrained by the lack of a macOS version. Spark organizes your inbox into card-like sections, including Personal, Notifications, Newsletters, Pins, and Seen. Spark’s ability to categorize email and customize how they are displayed is key to getting the most out of Spark’s Smart Inbox. Spark’s proficiency at recognizing different types of email is not perfect, but it works more often than not, bringing welcome order to your inbox. Categories can be displayed in a unified, grouped, or per-account way. One of the benefits of the Smart Inbox’s grouping is that you can activate a button at the top of each section to mark everything in that group as read, archive messages, or delete them. Spark also supports quick actions tied to trackpad swipes. By default, swiping right reveals options to Snooze or Archive email and swiping left lets you delete or pin emails, but you can also configure swipes to mark messages as read or unread, move messages, or mark them as spam. Snooze times are highly customizable and pinning is like starring in other apps, but places an email in a special Pins section of the Smart Inbox even if it simultaneously resides in another section like Newsletters. 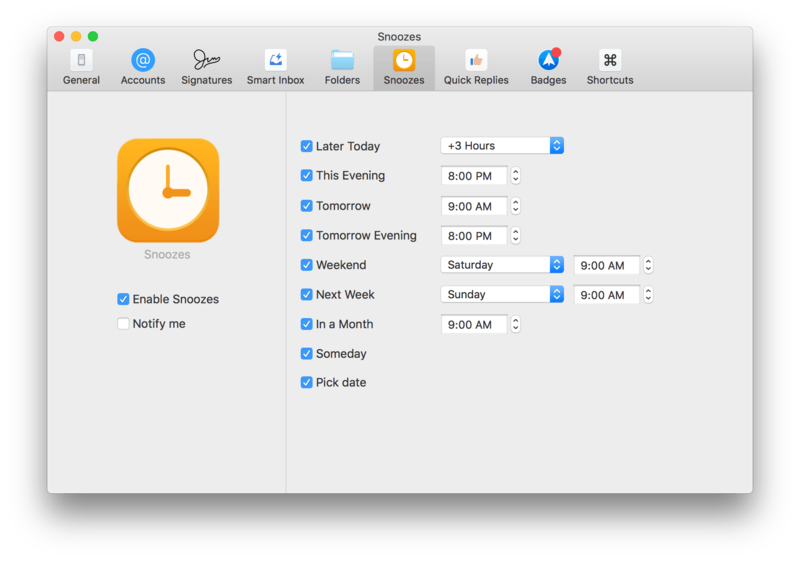 Spark's snooze options are highly customizable. An interesting tool that Spark offers and few other emails clients have is Quick Replies. Spark comes with eight built-in Quick Replies, like ‘Thanks,’ which sends a ‘Thank You!’ message with a green checkmark. You can also create your own Quick Replies with an icon and custom response. Quick Replies are available as a button at the bottom of messages that Spark identifies as being from people. Spark’s canned responses are not as powerful as you could create with apps like TextExpander, but if your needs are simple, Quick Replies may be enough for you. I have a couple issues with Quick Replies. The first is that they add a little ‘Spark by Readdle’ badge to sent emails that you cannot remove before sending your message. Second, it’s not clear from Spark’s UI whether sending a Quick Reply is the equivalent of ‘Reply’ or ‘Reply to All.’ When I click Quick Reply, there should be some indication whether it is being sent to everyone on an email or just the sender. Spark’s search functionality is fast and is smart enough to know ‘attachments from Federico’ means I want only messages from Federico that have attachments. One odd design choice, however, is that there is no indication in the UI that there is a way to search inside an email. If you type Command+F or select Find from the Edit menu, a search field appears from nowhere in the upper right-hand corner of the window. It’s a useful feature and one that shouldn’t be hidden behind menus or keyboard shortcuts. Spark supports multiple sets of keyboard shortcuts. Spark is not without some shortcomings. Account setup was fast and easy, except if you have two-factor authentication turned on for an iCloud account and forget where to go to get a single-use password. Spark provides an alert where two-factor authentication is required, but it would be helpful if Spark also included specific instructions on how to log in with two-factor authentication. I would also like to see an option for opening links in the background so I don’t have to hop between Spark and Safari windows as often. Notification handling is also different than most apps. You can mute notifications from strangers and for email that is automated, which is nice. However, Mac apps don’t typically display banner notifications or badge an icon if the app isn’t running, which Spark does and may be jarring to some users. It’s good to see Spark come to the Mac and I’m sure fans of the iOS app will be pleased that Readdle brought many features of the iOS version to macOS. Despite some rough edges and quirks in version 1.0, Spark’s clean design, email management tools, and ability sync with the iOS version using iCloud make it a solid choice, especially for users of Spark for iOS. 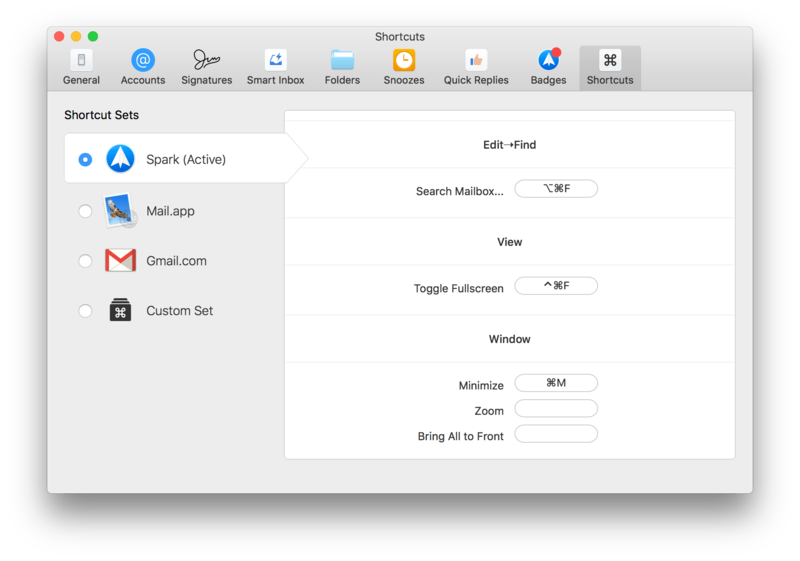 Spark for Mac is available on the Mac App Store as a free download.